As the demand on athletic competition becomes greater, you who are athletes must keep up with those demands. No matter what sport, this program will be your mental edge to develop your body the way you want it to be and keep it that way. 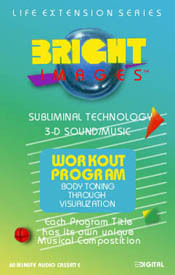 This program is designed to create that total mind and body relationship, mentally working to aid in the body's development. Your subconscious mind works on your self-image and will make it happen. You will improve everyday and you will be the best at whatever you do. This program is recommended for all who desire the most from their physical development.